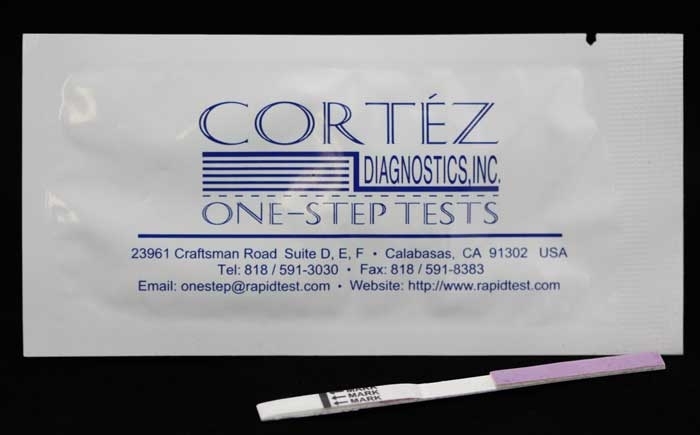 Los Angeles-based Diagnostic Automation/Cortez Diagnostics, Inc. offers a OneStep hCG Urine RapiDipTM InstaTest HCG Pregnancy Test Kit (3.5 mm strip) which is a pregnancy test kit for the determination of hCG (Human Chorionic Gonadotropin) in urine specimen. There is an appearance of hCG in urine soon after conception, and its subsequent rapid rise in concentration during early gestational growth. This Pregnancy test kit is used to obtain a visual, qualitative result for the early detection of pregnancy. 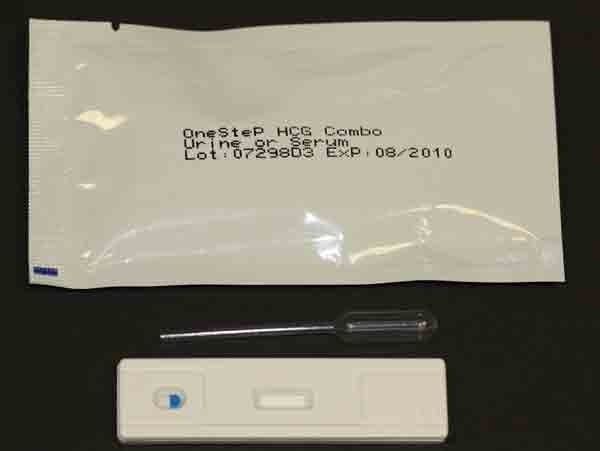 A urine specimen for this HCG Rapid Test must be collected in a dry and clean container. The first morning urine specimen is preferred for this Pregnancy Test since it usually contains the highest concentration of hCG; however, urine specimen collected at any time of the day may be used for this pregnancy test. 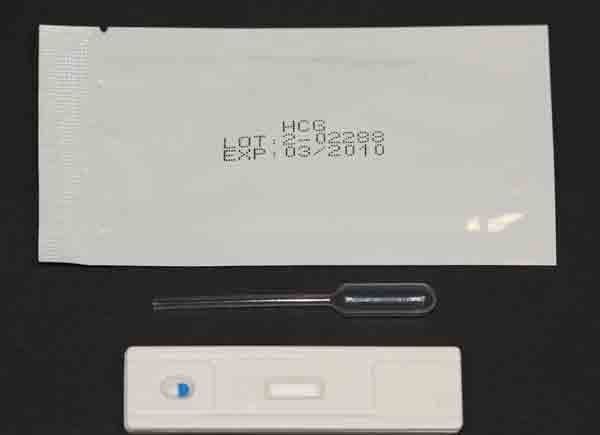 Urine specimen for this pregnancy test kit may be stored at 2-8C for up to 48 hours prior to testing. 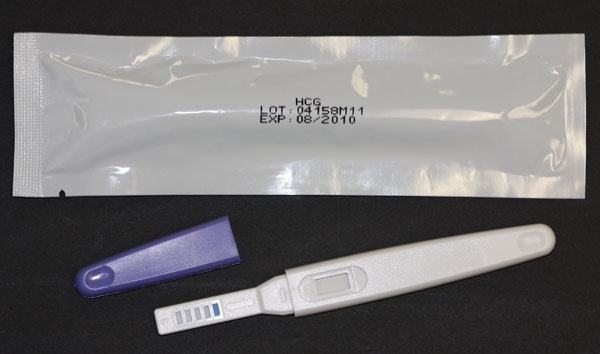 For prolonged storage, specimen may be frozen and stored below -20CÂ Frozen specimen should be thawed and stirred before using this pregnancy test kit. To begin testing for this HCG Rapid Test, open the sealed pouch of the Pregnancy Test Kit by tearing along the notch. Remove the Pregnancy test from the pouch and use it as soon as possible. Immerse the strip of the pregnancy test kit into the urine sample with the arrow end pointing towards the urine. Do not immerse past the â€œMarkâ€� Line. Take the strip out after 10 seconds and lay the strip flat on a clean, dry, nonabsorbent surface (such as the mouth of the urine container). Wait for colored bands to appear. Depending on the concentration of hCG in the pregnancy test specimen, positive results may be observed in as soon as 40 seconds. However, to confirm negative results on this pregnancy test, the complete reaction time of 5 minutes is required. It is important that the background is clear before the result of this pregnancy test is read. Do not read results from this pregnancy test kit after more than 30 minutes. The pregnancy test kit can be stored at temperatures between 2 to 30Â C in the sealed pouch to the date of expiration. The pregnancy test kit should be kept away from direct sunlight, moisture and heat. Along with this (3.5 mm strip) Urine HCG Rapid Test, Diagnostic Automation/Cortez Diagnostics, Inc. offers various pregnancy tests to fit any customer's needs.Â Other HCG Rapid Test Kits include:Â Combo Urine/Serum HCG Rapid Test 2.5 mm strip, Combo Urine/Serum HCG Rapid Test 5mm strip, and a Combo Urine/Serum HCG Rapid Test - cassette format.Â Additional pregnancy test kits include:Â Midstream Urine HCG Test Kit and a Urine HCG Test Kit (both in cassette format), a Urine HCG Rapid Test 2.5 mm strip, and a Urine HCG Rapid Test 5mm strip.